Heh, that looks pretty nice. Thanks Souvik. I am happy to have this project up and running again. For people curious about the specifics, the computer-everything else interface is an Arduino, sadly; I have a parallel port on this motherboard that I could use for the VUFans, but I need an analog output to PWM the RGB LEDs. Winamp interfaces with a piece of software called DiscoLites, which performs signal processing and writes to a network pipe. A C++ program I wrote called VUFanAdapter reads from this pipe, formats the data for the Arduino, and pipes it over serial. The Arduino separates it out, controls the fans, and PWMs the LED (soon to be LEDs). If you don't mind me asking, what is the purpose of PartyMode? PartyMode 1 turned a lab into basically a party space (although it never got used for that purpose); the term I made up for it was "transformable spaces". By day it was a computer lab that happened to have a few speakers in the corners, but with the press of a giant red button I put at the front of the room (and the flip of three ridiculously cool switches with red plastic covers and embedded LEDs), I could turn off the lights in the room (gogogo actuators and clever mechanical design), initialize the speaker system and Discoscreens across all the computers in the lab, and start pumping music and awesome lights and colors through the lab. 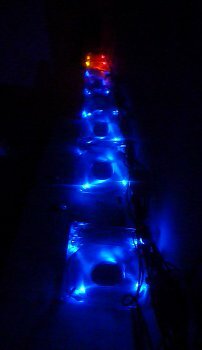 We had even planned to do the LED thing that I'm re-planning now, plus a discoball to descend from the ceiling, but unfortunately for several reasons we were never able to finish the project. Quite a few people replicated this idea, including Kerm. They developed their idea independently; I only recently heard about that. Old news. My roommates and I are designing a similar thing, to be controlled by our home automation system. I see. It looks pretty cool (from what I've seen from the 2 pics). I would like to see it in action one day. There's a video in that first post; can you not play it? And thanks! Nice work. I remember you showing me the fans when I visited, and I thought it was cool. Thanks shaun. 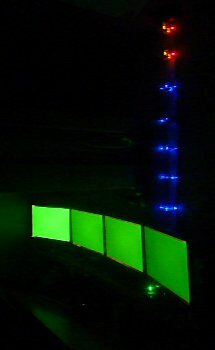 My biggest difficulty right now is finding affordable high-power RGB LEDs that aren't from shading Chinese distributors with terrible consumer reviews and/or months-long shipping. Edit: DShiznit, you definitely should! You can do the DiscoScreens stuff with no hardware, but the RGB LED illumination and VUFans requires that you either have an Arduino or other microcontroller, or a parallel port. Why not connect the fans and lights to relays and wire them to the equalizer? Ultimate Dev'r, I don't need to defend the originality of my ideas to you, I'm happy enough knowing what I came up with on my own. Which equalizer do you mean? I'm doing the VU meter division in software, and outputting the signals via Arduino (previously, parallel port). I was thinking a set of relays and resistors that get power from the Stereo. The louder and more amplified the sound, the more relays are tripped and the more lights turn on. No software needed. I could also do something similar to disco screens with LEDs and plexi-glass(possibly using circuitry from some of those light stands you put the acrylic blocks on with the laser-etched shapes), eliminating the need for expensive monitors. I saw that the relay trip thing is a bad idea because (1) you'd have to isolate and amplify the signal to the extreme, even if you used power transistors instead of relays, and (2) most VU meters are logarithmic (since sound is logarithmic) rather than linear. There are 237 users online: 7 members and 230 guests. Members: cwt1078, johnbchron, matkeller19, mr womp womp, reignofloki, RogerWilco, TheMustardCat. © Copyright 2000-2019 Cemetech & Christopher Mitchell :: Page Execution Time: 0.342970 seconds.